Detecting levels of Manganese has never been so easy! The new and improved SenSafe Manganese Check eliminates interference from several ions like copper, iron, cobalt, lead, nickel, etc. 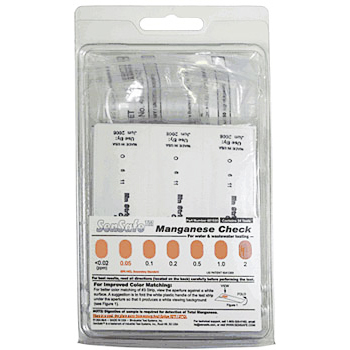 Designed to be a rapid, accurate alternative to wet chemical tests, SenSafe™ Manganese Check offers the user an easy dip-and-read test strip alternative for determining manganese concentrations in water. Manganese Water Test Kit is ideal for on-site testing when accurate results are immediately needed. Test strips #1 and #2 are used to prepare water sample. Steps to test: 1. 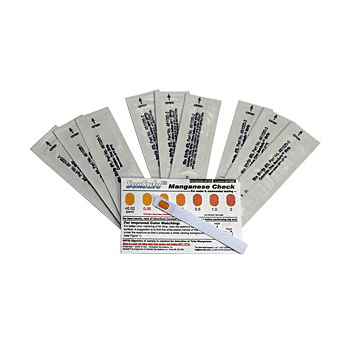 Collect water into a vial , 2. dip test strip #1 for 20 seconds, discard. 3. dip test strip #2 for 20 seconds, discard. 4. Dip strip #3 for 30 * seconds, pull out, wait 3 minutes for color to develop, match color chart.